Here are the 5 items we are currently loving…. 1. The Cross body bag-The cross body is one of our current favorites. It’s the perfect accessory for shopping, festivals and dates. It doesn’t take up much space and because of its size you only have room for your handbag essentials. Condense your bag for hassle free fun! 2. Sinful Colors Endless Blue Nail Polish– We have fallen in love with this color. Bold, bright and unexpectedly chic- This polish will give you flare without screaming teen spirit! 3. Cobalt Mirrored Sunglasses– Mirrored shades have been trending for some time now, but blue mirrored shades are the current craze. 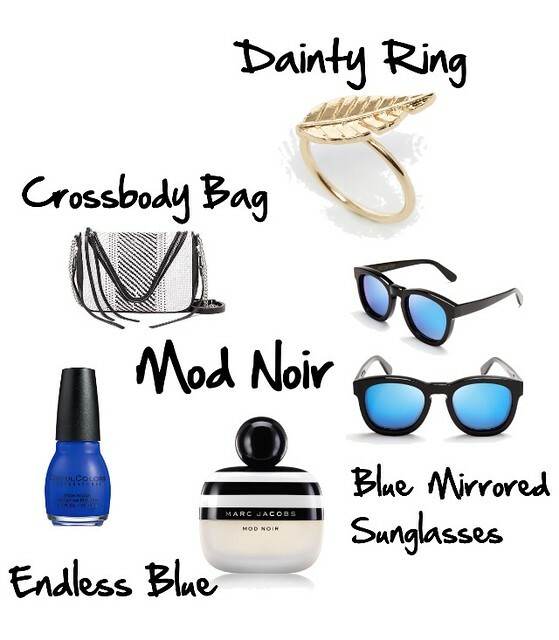 Bring instant cool to any outfit with a pair of cobalt tinted sunnies. 4. Dainty Rings– Stack’em or wear them alone; dainty rings are beautiful. Not to mention you can find them at any price point. These small rings are perfectly sized to add chicness to any hand. 5. Marc Jacob’s Mod Noir Perfume– Mod Noir is the exclusive, latest and greatest from our favorite perfumer, Marc Jacobs. In collaboration with Sephora, Marc Jacobs has created a romantic sent with hints of gardenias and dewy greens. Let the summer romance begin!